I keep thinking that epic letters section should have shortened and a few more pages of story would have been a more fitting way to celebrate issue 50. As Kirkman says in the letters section – cry me a river. The best that can be said about this issue is that it brings on the progression of one of the major, but hitherto underdeveloped, characters in this title. 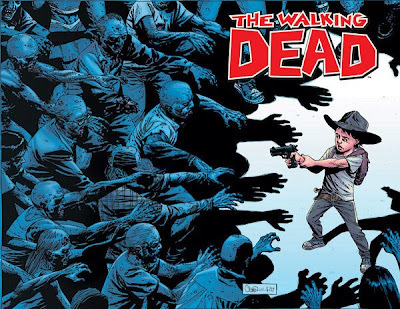 As Rick Grimes drifts in and out of consciousness, his son Carl is hostage to his emotions, as helplessness, anger, grief (especially in light of what happened in issue #48) and fear take hold. When unexpected visitors turn up at their hideout, Carl has to make some tough decisions. When those decisions are acted upon and resolved, we are left with Carl questioning his relationship with his Father and the dynamics of responsibility and duty of care that bind any parent and child. There is some great artwork, especially the final panel – which is, for once, something other than a cliffhanger, but actually all the better for it. I read the thing twice, and I got it more the second time around. The recent ‘no-one is safe’ arc was such a relentlessly violent and brutal series of issues that the change in pace in #49 and #50 is a bit of a jolt, and this issue is more thoughtful and relies more on the personality of the character of Carl. It does work. It works well because what we are witnessing is another character taking the centre stage, there is some character progression. When Carl speaks, his monologues just stay the right side of ‘perhaps a young kid would say that’. How many comic book writers can achieve that? The only criticism I have is that the letters page is about the longest I have ever seen – couldn’t some of that been sacrificed for a few more pages of story for issue 50?? Thank you Robert Kirkman. Thank you for 50 issues of great storytelling. Thank you Charlie Adlard for being able to illustrate this world of post-civilisation with the humanity, grace and brutality it requires. Review – don’t expect fireworks, but this tale is moving and moves the overall story on. The Walking Dead is still just about the best comic book out there right now. 8.7 out of 10.